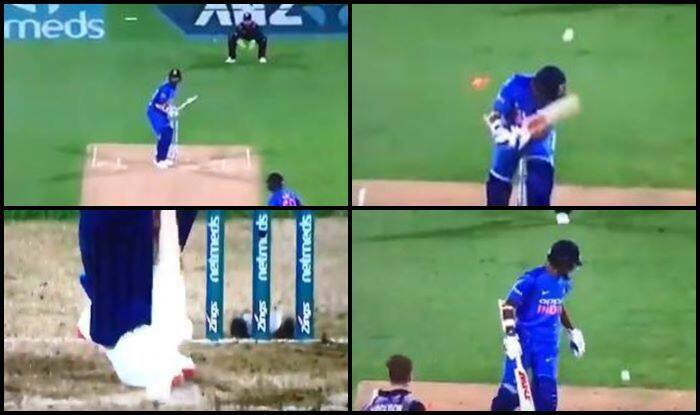 1st T20I India vs New Zealand: It was bowled at 151 kmph and was too fast for Shikhar Dhawan as he could not get his bat down on time as the ball crashed onto his stumps. Dhawan's cameo of 18-ball 29 came to an end in the sixth over. 1st T20I India vs New Zealand: It was bowled at 151 kmph and was too fast for Shikhar Dhawan as he could not get his bat down on time as the ball crashed onto his stumps. Dhawan’s cameo of 18-ball 29 came to an end in the sixth over. It was a searing pacy delivery at 151 kmph, full and honing onto Dhawan’s pads, beaten for sheer pace was the left-hander, the ball clipped the front-pad and then rattled into the middle-stump. Unplayable stuff from the quickie, he’s chuffed to bits and India have lost both openers. Once he was out, the Men in Blue were in trouble chasing a mammoth 220. Chasing 220, India captain Rohit Sharma was the first to get dismissed as he fell for one run off five balls.